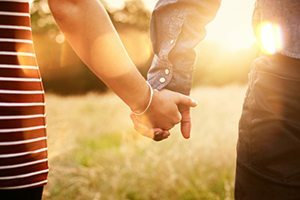 Often we don’t recognize how we ourselves possess traits that we think belong solely to our partner. Looking into the mirror of our partner, we are seeing unrecognized parts of ourselves. What in your partner do you believe is strange, unfamiliar, different from, or the opposite of you? What do you admire in them, that you wish you could attain? What do you dislike, that you are glad you don’t express? Mirroring works in both positive and negative ways. Whatever you notice is different in your partner probably exists within you as well. Perhaps it is dormant, or maybe it has been suppressed for years. The card MIRRORS invites you to connect with a positive quality you see in others, and bring it out in yourself. Start by imagining yourself expressing such a quality in your own way. What would you be doing or saying? How would you look or sound? What would you feel? By exploring these details, you can awaken positive resources within you. Qualities that you react negatively to in others also point to lost parts of yourself. For instance, take anger. Anger may be something one partner dislikes in another. But anger is simply a signal that one’s needs are not getting met. This is a vital signal to acknowledge, yet we may deny our experience of anger, seeing it only in others, but not in ourselves. Whether it is anger or something else, we have all lost touch with parts of ourselves. In childhood, we were trained to emphasize certain traits and neglect others. Through this process, we ended up ignoring or suppressing part of our full potential. This potential, which we are born with, includes all forms of human expression. We have intuition, intellect, and a wide range of feelings. We can be both assertive and receptive, extroverted and introverted, serious and light. We each have the potential and the right to embrace it all. Whenever you dislike or are disturbed by some aspect of a partner, it is a good time to ask where the same aspect lives in you. The card MIRRORS suggests looking beyond your negative judgments of this characteristic. Open your mind to consider the positive functions it may serve. How could having access to such a quality, expressed in your own style, increase your sense of flexibility and resourcefulness? Each of us can increase our range of human expression. In awakening dormant parts of ourselves, we remove old limits and discover new flexibility. This is called personal growth. Whenever we notice how a partner mirrors underdeveloped qualities in us, we are fostering such growth. 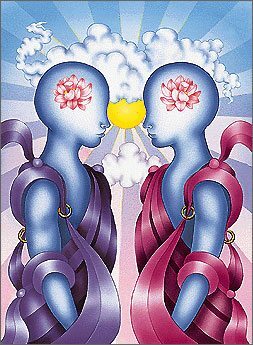 Instead of envying or reacting to differences in a partner, the card MIRRORS invites you to focus back on yourself. See what may still be dormant within you. In connecting with lost parts of yourself, and developing them in your own way, you manifest your human birthright of wholeness.